Size: 351 sq. m. "living 150, balcony 200"
Jomtien Beach Paradise floor 4, on Jomtien Beach Road. 2 bedrooms (1 ensuite), 2 bathrooms, European kitchen, lounge/diner, enormous balcony with Jacuzzi, washing machine, and Thai Summer house. Excellent sea view and panoramic view. 3 air cons, 9 ceiling fans, fridge, microwave, home theatre with UBC satellite, water purifying system, ADSL Internet. Facilities include 24 hour security, swimming pool, reception, fitness centre, tennis courts and shop. Built 1990. Recently refurbished. 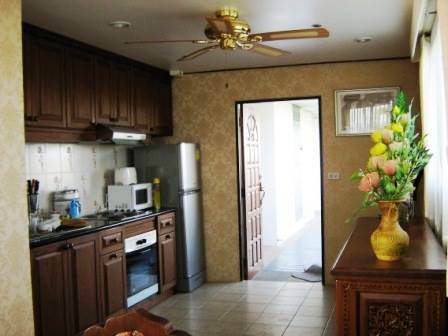 Valued by 3 estate agents at between 10 & 11 million Baht. Maintenance 4,815 Baht per month. For sale at 9.5 million Baht or rent at 57,000 Baht per month. Foreign ownership. Our reference JTC1037.